Our Correspondent ● Kolkata: The French embassy in India has offered nearly 400 scholarships under its flagship Charpak programme for students pursuing master’s degrees, exchange semesters and research internships in France. 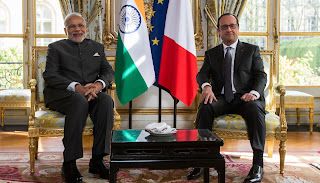 During prime minister Narendra Modi’s visit to France last April, both countries had agreed to allow Indian students to stay in France for two years, one for the period of studies and one after completion of the course to acquire professional experience, with a reciprocal arrangement for French students in India. France, which ranks third among the world’s most innovative countries, is also among the top three most popular destinations in the world among international students. Every year a pre-departure orientation session, along with a scholarship award ceremony, is organised for students about to visit France.